Periodically (as in, the last two days) I have a weird sound and pressure in my ear and I am absolutely convinced that there is a moth living inside it. When I was little my mom told me I wasn't old enough to shave my legs, (for fear I would cut myself), and I went behind her back and did it anyway. Only, I shaved one leg and felt awful and full of guilt and immediately confessed. And then she made fun of me because WHY DID I ONLY SHAVE ONE. I punished myself. 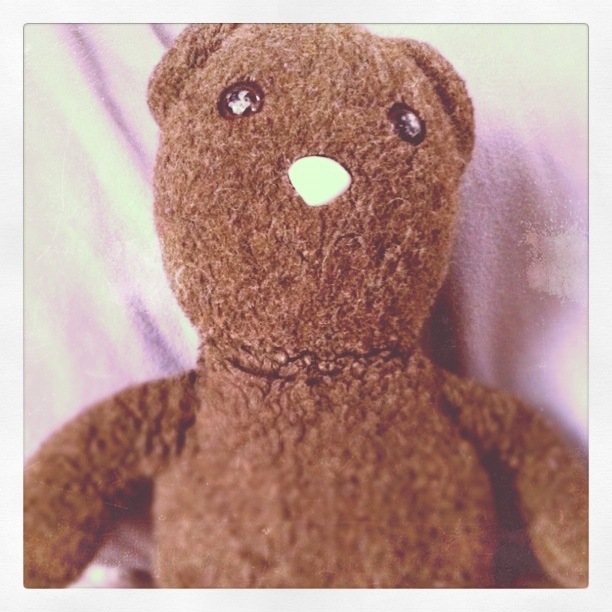 I am twenty-five years old, and I still sleep with my teddy bear. His name? Brown Bear. (For reasons unknown to me). Come on, tell me something awkward about yourself. PLEASE. p.s. I just got back from VENICE. As in, Italy. Exciting post to come. P.S. I LOVE your blog posts. Miss you. I love brown bear, especially his patch of long hair behind his tag. I'm with you on the Brown Bear thing. I slept with my grimy old (and wonderfully dear) baby blanket until my wedding day... and only stopped then because Addison was creeped out and excommunicated it. I may or may not have cried. I have a confession. Whenever I'm by myself in the car I pretend I'm starring in a music video. To 90% of the songs that come on. I even check out my moves in the sun visor mirror.